Both fresh air filtration and heating/cooling can be achieved in a single system, with 100% fresh air intake possible. Indoor units and fresh air processing units can be connected to the same refrigerant system, increasing design flexibility and greatly reducing total system costs. 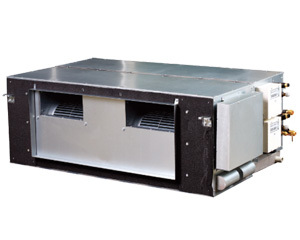 External static pressure can be up to 196Pa (models 125 to 140) and 280Pa (models 200 to 280) which allows extensive ductwork runs and flexible application: ideal for use in large areas. Fresh air is introduced, providing a healthy and comfortable living environment. Four speed fan motor (model 125 and 140).